Story: Dilat Larath is Iznogoud's faithful helper and servant, when he tries to become the Caliph instead of the Caliph. Background notes: In the insane World of Iznogoud's attempt at becoming the new Caliph, Dilat Larath (Wa'at Alahf in English publications) is propably the only really sane person, and the one to put the absurd ideas into perspective (a little like Lt. Flap does with military logic in Beetle Bailey). Dilat Larath has been with Iznogoud from day one through all the media that the comic has been transferred to. 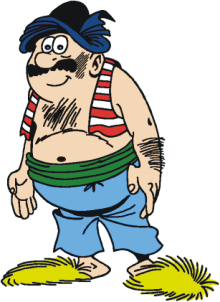 In the cartoons the voice was possibly done by Arno Chevrier, who also played Dilat Larath in the movie, as Michaël Youn and Jacques Villeret did both the voices and played the characters of Iznogoud and the Caliph respectively.